As for linguine alla cecca, it's a hot pasta with a cold tomato and basil sauce, and it's so light and delicate that it's almost like eating a salad. I have been a lazy cook this week. After nineteen months cooking for a family, I have rented a room in a friend's house in the Cotswolds. It is quiet, and calm, and neighbours drop round to ask for cooking advice, or drop off some fruit they've just picked. I have given myself a month out of London: a writer's retreat, of sorts, and have so far spent it looking out the window at the furious storms that arrive without warning over the valley, making endless cups of tea, running up and down steep hills, and trying to fill the aggressively blank white pages of a word document with some coherent sentences. Once the sun sets, and the need to switch the lamps on alerts me to the time, I head downstairs to the kitchen. I have been working on a cookbook for so long now that standing in front of a hob has a tendency to feel like work. This is a frustrating reality to be faced with - I love cooking, and have since I was a child. And so, for the past week, I've been putting no pressure on it at all. Ive made toasted cheese sandwiches, with hot lime pickle (we ate them while watching Get Out through our fingers), chopped root vegetables for the simplest possible soup, and have lost count of the number of times I've put a pan of water on to boil for some pasta. With sweaty, muggy July and August now a distant memory, and the cold nights drawing in, it's probably time to accept the move to autumnal produce. The apples are already falling from the tree in the garden two doors down, landing fresh and crisp in our fruitbowl mere hours later. But I wanted, this week, to offer tomatoes a last hoorah. A send of worthy of my beloved favourite, as I wave goodbye to the bowl of fresh tomatoes on the dining table, and stockpile tins instead. You're relying on the glory of tomatoes for this recipe, so only make it when you can put your hands on lovely, ripe ones. These ones were so good that I ate more of the cherry tomatoes than I had planned, reaching into the bowl every time I passed, and bursting their firm skins between between my teeth. This sauce, such a reassuringly simple one, ready in the time it takes to boil the pasta, and drink a cup of tea, is the perfect vehicle for them. It's one I'll be making again and again - once summer comes back around to meet us. 1. Fill your pan with water, and put it on to boil. Half fill the bowl with cold water. Slice a cross in the base of each tomato. 2. Once the pan of water is boiling, drop the tomatoes into it, and leave them to bob along for a minute. Scoop them out, and plunge them into the bowl of cold water to cool. Bring the pan of water back to a rolling boil, salt it, and add the linguine. 3. While the pasta is cooking, drain the tomatoes, then peel their skins off. Cut them open, scoop out the seeds, and chop out the core. Roughly chop them, or pull them apart (cherry tomatoes can, once deseeded, be left whole), and add them back to the bowl. Add the basil leaves, the garlic clove, olive oil, salt, pepper, and chilli. Mix together with your hands, and allow to sit while you have a cup of tea. 4. When the pasta is al dente, drain it, and add it to the bowl. Toss everything together. Remove the garlic clove, and serve immediately. It's a thing you can have in the summertime. One, because it's chilled and, two, because you need seasonal tomatoes. But it's very simple and easy to make (in the whizzer). I decided to make some using a recipe that came from the wife of the Spanish Ambassador (via Pippa), so bona fide. I couldn't believe the amount of olive oil you were supposed to put in, so I only put half the amount, and it came out a bit thick. Me: That's the Spanish Ambassador's Gazpacho. I had never planned on being a nanny. After leaving teaching, and then my job as a young people's theatre producer, I assumed that, moving forward, the kids I would spend the most time with would be the ones that my friends were having - or perhaps one I may eventually have myself. And then in February 2016, I moved into a room in a family house in Clapham. I arrived with a bag filled with books, a hardy green plant in a pot, and a small selection of things from my wardrobe. A ten-year-old helped me unpack that first night, asking a thousand questions while she did: which dress was my favourite, why I needed so many lipsticks, how many books I could read in a month, why I didn't sound as Australian as the characters on Home and Away. Since that first night, we've been through a lot together. We've traveled (to Santa Barabara and Majorca), we've grumbled as we fought off shared colds, we've baked more biscuits than I can count, we've crammed for Latin tests, we've decorated a Christmas tree. After eighteen months, I know that this (now) eleven-year-old, her seven-year-old brother, and their mum, will be part of my life forever. Being a nanny hasn't been like any other job I've had, and leaving it doesn't feel familiar either. I am leaving much more than a job, but a house I have called home. This weekend, I'll put my books into boxes in the loft, pack as many dresses as I can fit into my suitcase, and will sadly relegate the hardy green plant to the bin (less a well-timed metaphor than a result of neglect - it never quite recovered from my abandoning it for a month in July). I saved Love, Nina for these final weeks of nannying, and am so pleased I did. The book is a warm and witty look at life in someone else's home, and time spent building relationships with a family. It reinforced the feeling I have of being part of a unique club; a group of friends and strangers who are ex-nannies, inextricably linked to the families we have shared a home with. 1. Preheat the oven to 180C. 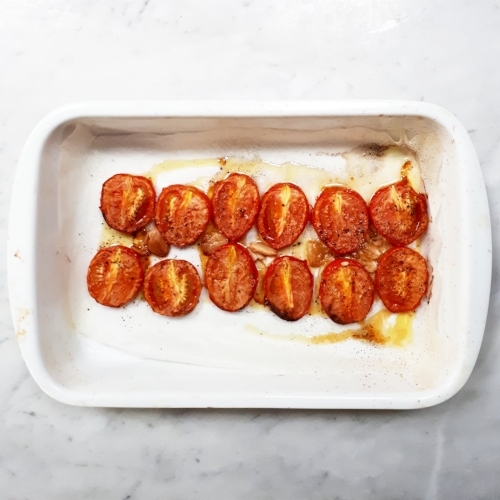 Slice 600g of the tomatoes in half, and arrange them in a single layer in a roasting tray. Add the peeled garlic cloves to the tray, drizzle with a little oil, and season with salt and pepper. Roast for 45 minutes until soft, and caramelised at the edges. Allow to cool. 2. Blitz the roasted tomatoes, fresh tomatoes, cucumber, red onion, and garlic in a blender until smooth. Add the red wine vinegar, taste and season. 3. While the blender is running, slowly pour in the olive oil. The soup should be smooth, creamy and emulsified. 4. Press the soup through a fine sieve, and refrigerate until cold - at least four hours. Whisk it when it comes out of the fridge, pour into chilled bowls, and serve with a drizzle of olive oil. Pasta con le Sarde. The Terracotta Dog. Exquisite, but deadly. Montalbano gave her a hug. There are few characters who eat as well as Inspector Montalbano. While he is out solving murders, his incredible housekeeper Adelina fills his fridge with the most delicious sounding dishes: tender octopus, rich, nutty cakes, fish fresh from the sea. I am hardly surprised: I have never eaten quite so well as when on holiday in Italy. Each time I have been lucky enough to go - a life-changing visit when I was 12, a road trip with a friend ten years later, a wedding a couple of years ago - it is the food I come home speaking about. Food that, despite its familiar components, changes dependent on where in the country we are, making the most of the local landscape. This pasta is a Sicilian classic - one that speaks of culinary influence from the Middle East (the nuts, sultanas and saffron), and of the Mediterranean sea, never far away when in Sicily. It is the work of no more than 15 minutes, the sort of thing you can come home to after a long day at work, relying mostly on ingredients you might already have in your cupboard. If you have access to fresh sardines, do use them here, but tinned ones work well too. They're a favourite ingredient in my kitchen, great mashed onto toast, and the star in this pasta dish. I know it's not particularly pretty, but it's a dish that has filled me with joy on these cold January days; a nod to a place I long to visit again. This May I'm returning to Italy with my family. We have much to celebrate: a couple of 30th birthdays, a 60th, my stepfather visiting Europe for the first time since I moved over. We're staying in houses with kitchens, keen to take advantage of local markets. We'll drive around and explore new towns, we'll read books in the sun, and we'll get far too competitive over board games. But most of our time there will be given over to food. It normally is, when we're all together. 1. Fill your largest saucepan with water and put it on to boil. Tip the breadcrumbs into the frying pan and toast over a medium heat until golden brown. Set aside. 2. Warm the olive oil in the pan and fry the onion until soft. Add the anchovies, and cook with the onion until they melt. Add the white wine, and allow it to bubble away for a moment. Stir in the tomato paste, until the onion is coated with the anchovies, wine and tomato. 3. Stir in the sardines, fennel, saffron, pine nuts and sultanas. Cook over a low-medium heat for ten minutes, ensuring that you cook the sardines through if they are fresh. 4. Meanwhile, cook the pasta to the packet directions, ensuring you drain it while it is still al dente. Reserve a mug full of the cooking water in case you need it to lubricate the pasta and sauce. 5. Tip the pasta into the sauce and stir it through. If it is a little dry, add some of the cooking water and a dribble of oil, and stir again. 6. Top each portion with the toasted breadcrumbs and serve.